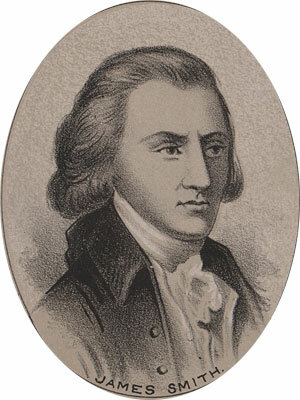 James Smith was born in Ireland around 1719. He emigrated to Cheshire County Pennsylvania with his family when he was ten or twelve years old. His father was a successful farmer and James benefited from a good, simple, classical education from a local Church Minister. He later studied law at the office of his older brother George, in Lancaster. Smith was admitted to the Pennsylvania Bar at age twenty-six, and set up an office in Cumberland County, near Shippensburg. This was a frontier area at the time, so he spent much of his time engaged in surveying, only practicing law when such work was available. After four or five years he moved back to more populated York, where he might practice law exclusively. During the 1760s Smith became a leader in the area. He attended a provincial assembly in 1774 where he offered a paper he had written, called “Essay on the Constitutional Power of Great Britain over the Colonies in America.” In the essay, he offered a boycott of British goods, and a General Congress of the Colonies, as measures in defense of colonial rights. Later that year he organized a volunteer militia company in York, which elected him Captain. His company later grew to be a battalion, at which point he deferred leadership to younger men. He was appointed to the provincial convention in Philadelphia in 1775, the state constitutional convention in 1776, and was elected to the Continental Congress the same year. He remained in Congress only two years, and as Congress was meeting in Philadelphia in those days, provided his office for meetings of the Board of War. James Smith retired from the Congress in 1777, and served in few public offices after: one term in the State assembly, a few months as a judge of the state High Court of Appeals. In 1782 he was appointed Brigadier General of the Pennsylvania militia. He was reelected to Congress in 1785 but declined to attend due to advancing age. Little is known about his work, because a fire destroyed his office and papers shortly before he died.